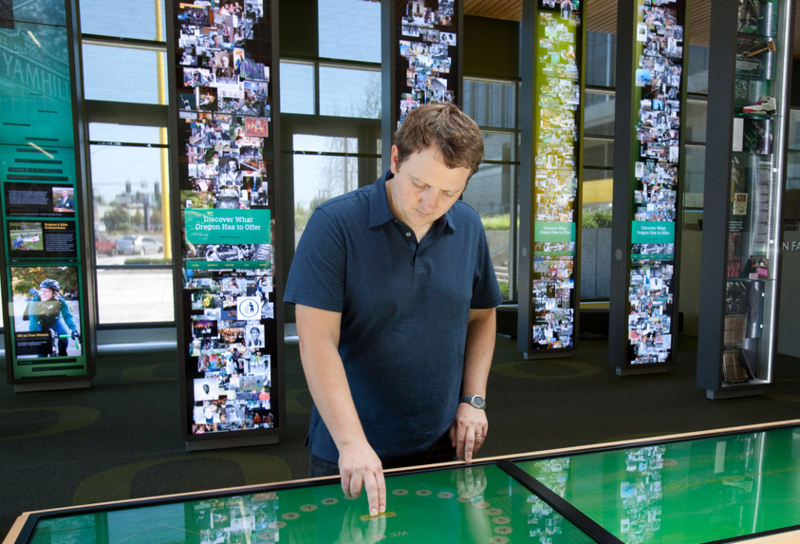 The 2,000-square-foot space is filled with six interactive media Cascades and three artifact-filled Cascades, an interactive table and a owner programmable donor wall. 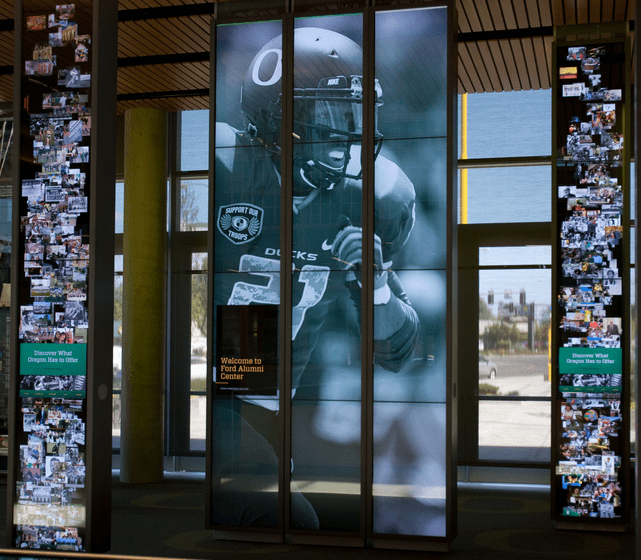 The stories and objects they feature preserve the legacy of the alumni who defined the University while the dynamic database that fuels them serves media and information to recruit new generations of Oregon alumni. 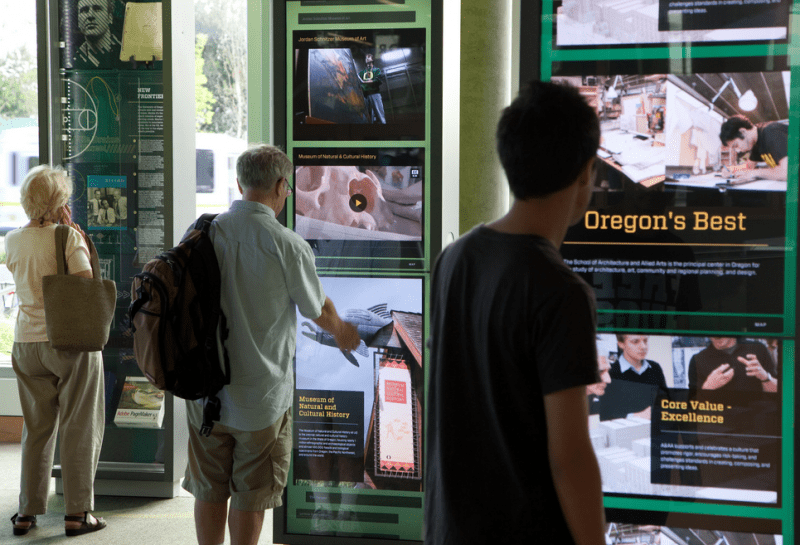 Nine towering panels filled with interactive media and artifacts reveal the past, present, and possibilities of the University of Oregon experience. The media Cascades are touch-sensitive floor-to-ceiling displays that present movies, images, slide shows, text, infographics and maps reflecting the university as a whole. 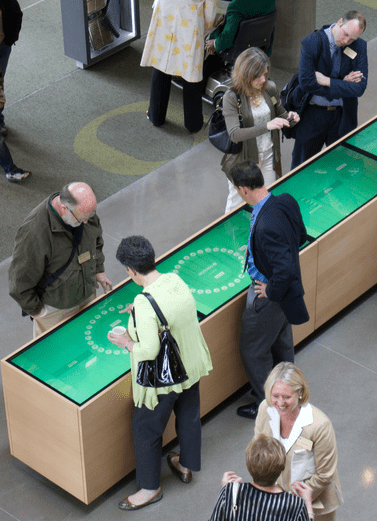 Visitors can simply stand and watch to see all the university has to offer, while more active visitors could swipe across the Cascade to navigate through stories, touch to dig deeper into specific areas, or access menus to go directly to the information they seek. The Cascade panels slide on a track system built into the floors and ceilings running throughout the Interpretive Center. The Interpretive Center staff can slide the panels anywhere on the tracks, making the space adaptable for different events and reconfigurable for different usage patterns. In one configuration, three Cascades can be merged to form one large display, and the on-screen content can be easily customized for special events.